Ah the Holidays, time with family and friends and way too many reasons to celebrate. While the classic eggnog with rum or hot apple cider are always good choices, I tend to reach for a glass of bubble more often than not. While there are great representations from around the globe, BC is producing some incredible sparkling wines in a variety of styles. We have the perfect climate in BC for sparkling wines that produce ripe fruit and great acidity. Many say that BC sparkling should be the foundation of what we are known for globally; and the sparking wines below are some good candidates to show that. Whether you are bringing a bottle to a party, sitting around the fireplace or picking out a gift for your boss, think bubbles! Fitzpatrick Family Vineyards is located at the historic Greata Ranch property, situated between Peachland and Summerland. Fitz Brut is their signature Cuvée. A blend of Pinot Noir, Chardonnay, Meunier, flavours of crisp apple, green pair, lime and a touch of brioche. Great Acidity! Nestled in the Cowichan Valley here on Vancouver Island, this little winery has made quite a name for themselves for producing quality wines with both classic varietals and hybrids. This limited release Charmat-method sparkling wine is made from 100% Cowichan Valley Pinot Noir. It offers festive notes of cranberry, pink grapefruit and ginger with a creamy body. Perfect for Christmas dinner! 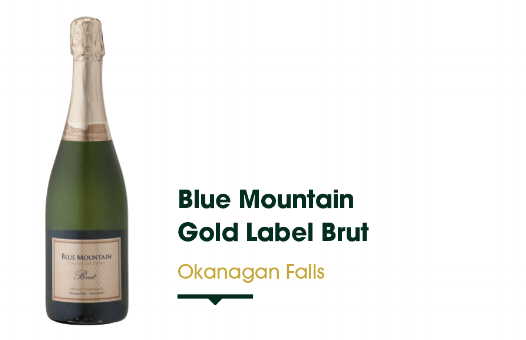 Blue Mountain Winery resides in Okanagan Falls and has been producing sparkling wines since the 1970s. The Gold Label Brut is a staple made in the traditional method. Enjoy its fine mousse texture, creamy lemon, toasty character and crisp lemon finish.